Is any outage of the tool critical incident for my organization? 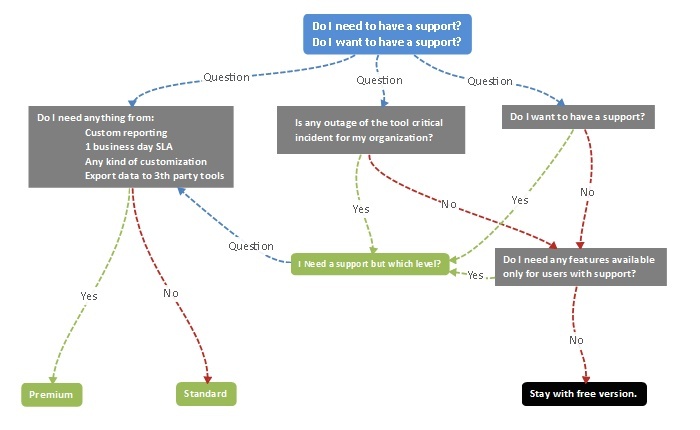 If any of your process in your organization depending on this tool, you should have a support. Example: LPAR2RRD is used for capacity consumption/allocation reports for business units and based on this reports are these units charged. Do I need some feature which is available only within supported version? In case, you need any kind of reports get automated, with some customization to fit your requirements, then support is best approach. The same is valid for additional features, like export of data collected by our tools in to 3th party tools. Which level of support I need to chose? If you need best SLA, report automation or any change or customization (ie. reports) then Premium support is needed. In case, you just need only some feature which is not available in free version, Standard could be sufficient. How would the support be implemented? Will the customer sign a contract, a Software Maintenance for LPAR2RRD or anything like that?